Interactive light-up alphabet buttons and turning clock hands teach phonics, letters,spelling, animals and their characteristics, memory skills and time concepts withmelodies and sound effects. Batteries included. 2-5 Years…. This toy costs approximately £18.49 (for the latest and best prices make sure you check our retailer list for the VTech Alphabet Apple above). 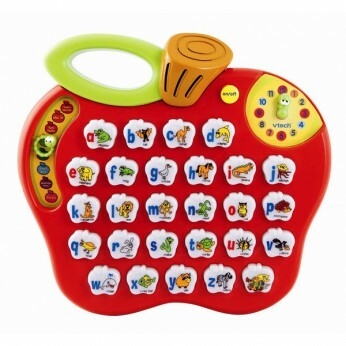 In our review of VTech Alphabet Apple we classed it as being suitable for ages 3 years, 4 years, 5 years but recommend you check the manufacturer specific advice before purchasing.